We’ve been asked a fair bit over the last month what our stance is on mental health. There seems to be two camps growing up in the youth sector. 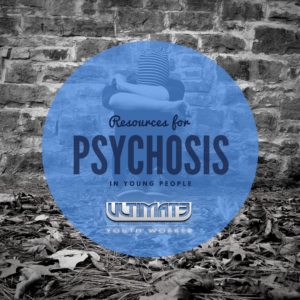 Those who see us as generalist youth workers who do not need to know about mental health except that we should refer on to more qualified help and those who believe that as one of the biggest issues facing our young people is something we should know about…mental health. One camp is ignoring issues for the sake of the profession, the other is seeking to adapt with the times. It will come as no surprise to our long term readers that we sit in the later camp. 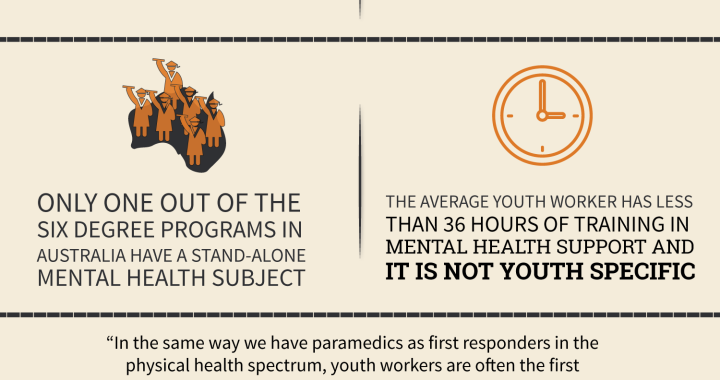 We believe that youth workers provide a first responder service to young people experiencing mental health issues in the same way that paramedics provide physical health services. We often provide gatekeeper services to mental health support through triaging the case and providing support until a mental health professional can take them on. We do this now, and with little or no specific mental health training. We believe that by our inaction in dealing with our young peoples mental health we are, by default, causing harm to them. 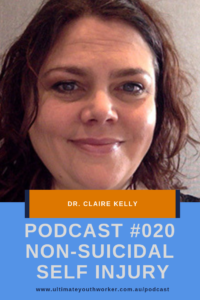 We are not advocating that all youth workers become mental health clinicians. We are saying that we need more than a mental health first aid certificate. A two day course is not enough. We need to faithfully support our young people in all their trails and tribulations. We need to come to grips with the fact that our training programs written decades ago have lost their relevance and we need to update our frameworks. It is up to the academics to change the course structures. It is up to the sector to demand this. 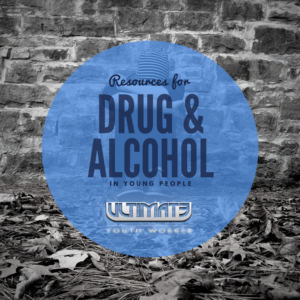 It is every youth workers responsibility to become better than they are right now. Mental health is only one area we need to become more proficient in. We have met with a number of our supporters lately and one question keeps coming up…What are we up to at the moment? We have been at the forefront of discussions in the youth sector for the last three years and to be honest the cuts to the sector have taken their toll on us. This year did not start with the bang we had hoped for. But like the phoenix we are rising from the ashes! over the last couple of months we have focussed in on what you have been telling us over the last few years. We keep hearing that youth workers all over Australia are feeling out of their depth when supporting their clients with mental health issues. This is often due to a lack of training. The historical focus has has also been against us with psychologists and social workers being the key players in this space. Over the next few months we will be taking the knowledge we have gained and we will give it back to you! We will be focusing on what we need to know to face the young peoples challenge of the 21st century… youth mental health. Let us know what we can do to help you and your organisations meet the challenge of youth mental health. We will be running some training by the years end specifically for youth workers… and more than just mental health first aid. 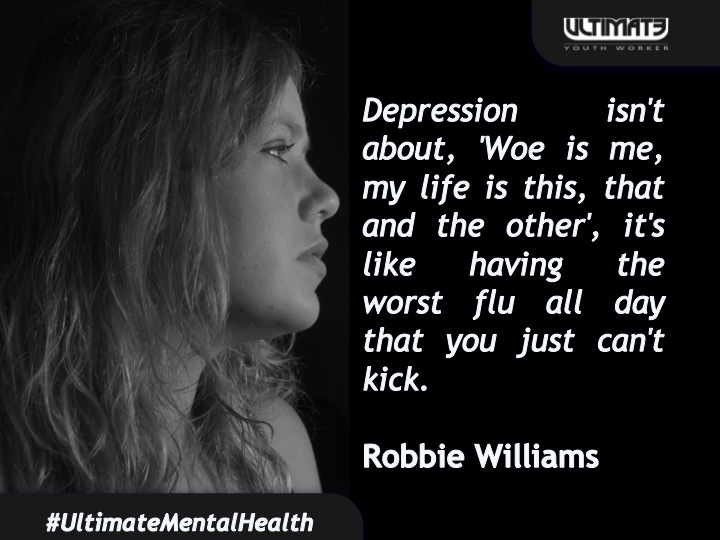 We continue mental health month at Ultimate youth Worker with the most spoken about of brain disorders, Depression. Depression goes by many different names and it stalks people with the skill of a bloodhound. It chases you down in everyday situations and squashes your ability to reach your goals. The most disturbing quality of all is it slowly stops them of life. When we speak of depression as a disorder of the brain we are speaking of the everyday crippling sense that the world is going to squash us that some of us feel that stop us from living our life to the full. The common feature of all depressive disorders is the presence of sad, empty, or irritable mood, accompanied by somatic (physical) and cognitive (mental) changes that significantly affect the individuals capacity to function. The black dog and its friends spend most of their time making our mood low which in turn makes us physically and mentally feel like we are walking in mud. Our ability to deal with the day to day stresses of life, work productively and fruitfully, and make a contribution to our community becomes limited and if it persists can become a chronic condition. The major differences among the depressive disorders are issues of duration (how long the symptoms last for), timing (whats happening for you at the time), or presumed aetiology (the causes, or manner of causation of a condition). Symptoms of depressive disorders can last from two weeks to a number of years. The onset of the symptoms can be a certain time of the month through to a significant bereavement and anything in between. …represents the classic condition known to most of us in this group of disorders. It is characterised by discrete episodes of at least two weeks duration (although most episodes last considerably longer) involving clear cut changes in affect, cognition, and neurovegetative functions and inter-episode remissions. 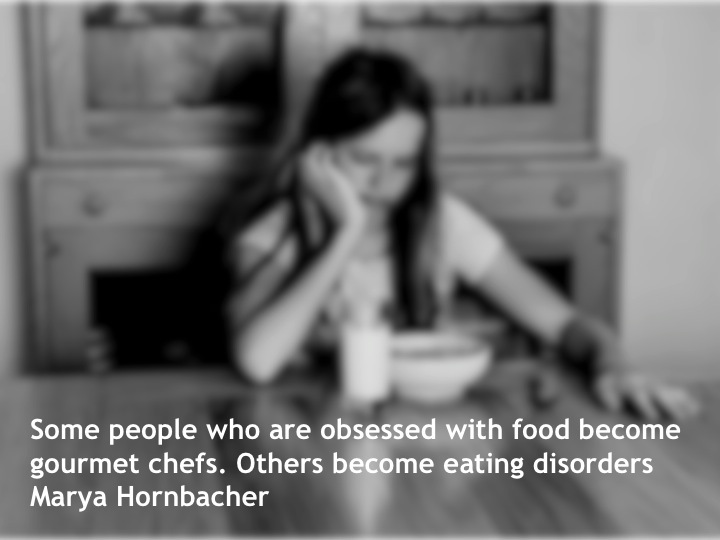 While these brain disorders can be diagnosed as one off episodes they are more often recurrent in a majority of cases. 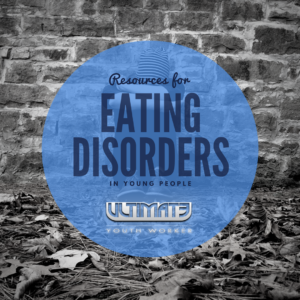 As youth workers we will work with many young people with depressive disorders. We must have a strong understanding of the diagnostic criteria, treatment options and recovery planning for young people living with depression. We can then support them to make informed decisions about the treatment planning and recovery orientation. We owe it to them to be well informed. Anxiety is a problem faced by around one in ten young Australians aged 18-25. For young people aged 13-17, the figure is approximately one in twenty-five. Anxiety is a normal emotion experienced by everyone at some stage. It is an emotional anticipation of future threats. It is often associated with muscle tension and vigilance in preparation for future danger and cautious or avoidant behaviours. Anxiety disorders differ from developmentally normative fear or anxiety by being excessive or persisting. However, Anxiety disorders come when a persons level of anxiety is heightened over an extended period of time beyond developmentally appropriate periods. Anxiety disorders differ from one another in the types of objects or situations that induce fear, anxiety, or avoidance behaviour, and the associated cognitive ideation (American Psychiatric Association, 2013). We aren’t going to go into detail about all of these here (Phew). What we want to give you is an overview. In time we will go into some detail on these disorders. 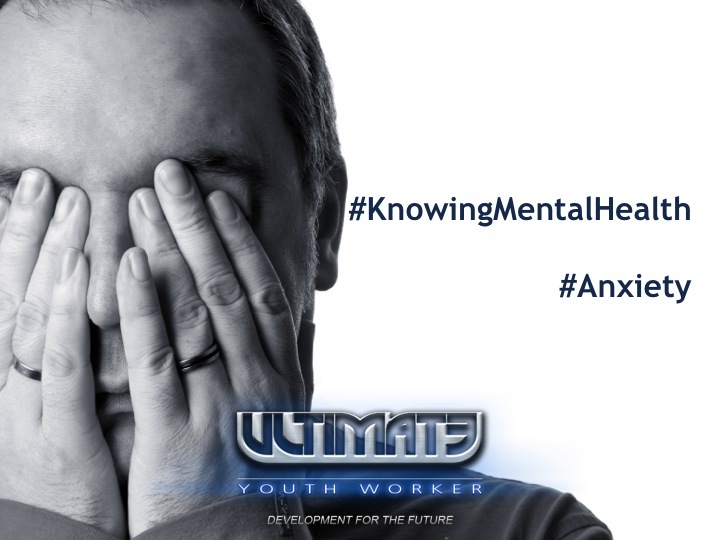 Approximately twice as many young women are diagnosed with anxiety disorders as males. 14% of females and 8% of males have experienced an anxiety disorder in the last twelve months this is equivalent to around 435,000 young people in Australia every year. This mean we are extremely likely to have clients with an anxiety disorder during our career. Anxiety is the number one mental health issue we will find ourselves working with. Anxiety disorders often have comorbid disorders alongside them so it is important for us to understand the extent of the issues surrounding an anxiety diagnosis. Get to know the diagnostic criteria for these disorders. Know as much as you can about them. Your young people will thank you for it.